Home > Throat Surgeries > What is a Tonsillectomy? A tonsillectomy is a surgical procedure that is carried out to remove the tonsil tissue that is found at the back of the mouth in the throat. Why Do I Need A Tonsillectomy? In the past a tonsillectomy was the treatment of choice for many patients who had previously suffered with a few episodes of tonsillitis. Nowadays however this practice has changed and the procedure is only carried out to those who have had several recurrent bouts of the illness with each episode lasting longer than usual or for those who suffer very badly from the symptoms and are finding that their quality of life and ability to work are becoming too difficult to manage. There are also a small number of people who have very enlarged tonsils and find that their airway is obstructed by their presence and may develop very dangerous complaints such as sleep apnoea (when the person stops breathing in their sleep for short periods). There are several ways of carrying out a tonsillectomy. The most popular method is to use a device called a snare, during which the tonsil is dissected away from the surrounding tissues of the throat and a snare passed over it which is then tightened until the tonsil is free of all surrounding tissues. It also possible to use a vibrating device that passes ultrasonic waves to the tip of the instrument which cuts the tissues and stops bleeding at the same time. Other methods include the use of lasers or using thermal equipment though this is a fairly new concept.The type of method you will receive will depend on your surgeon’s preference and usual practice along with the availability of equipment in your region. After the operation you will need to stay in a position that keeps your head elevated such as resting on a few pillows. You will be offered pain relief and there is no reason why you shouldn’t use it as directed. 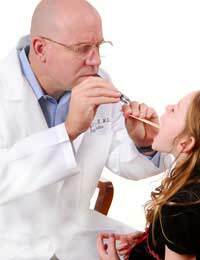 Adults tend to feel slightly worse levels of pain that children after a tonsillectomy. As with all forms of surgery there are certain associated risks, many are part of the anaesthetic and surgery whilst others depend on the general physical health of the patient. There is a small risk of infection following the procedure though with a tonsillectomy this risk is fairly low. There is also a small risk of bleeding which can be very distressing for the patient especially if a return trip to theatre is needed or a blood transfusion needs to be used. There is also a risk of a post-operative bleed occurring which can be dangerous if a clot forms in the throat and obstructs the airway. If you are due to have a tonsillectomy and are worried about post-operative bleeding please speak to your surgeon or anaesthetist who will explain the risks in more detail and hopefully will reassure you. In general, a tonsillectomy is not considered to be a high risk procedure as many are carried out every year without complication. A tonsillectomy used to be a very common operation carried out for many people both old and young. These days it is only carried out when absolutely necessary but is still a relatively safe procedure carrying few risks.